Wicca is a nature based spiritual practice from pre-roman northern Europe, which honors the feminine principal. In the Wicca way, all is accomplished via energy manipulation. Everything is energy. This knowledge used be called santanic, then insanity, now its called quantum physics. For Wiccas, this is simple awareness. Wiccas do not have 'faith', we have experience. We believe our natural senses. The Wicca awareness of all we feel, hear, smell, taste, touch, feel, is our spiritual practice. My ability to be aware of the Earth, Air, Fire, Water, as well as gravity, temperature, the flow and fall, the push and shove of all the natural forces around us, gives me my seemingly 'magical power'. This is simply knowledge, awareness, of the forces and how to spin, divert, increase or weaken those. I have an unusual talent for sensing these patterns. It was my privlidge to have studied Wicca and women's spirituality under the deeply respected Starhawk. 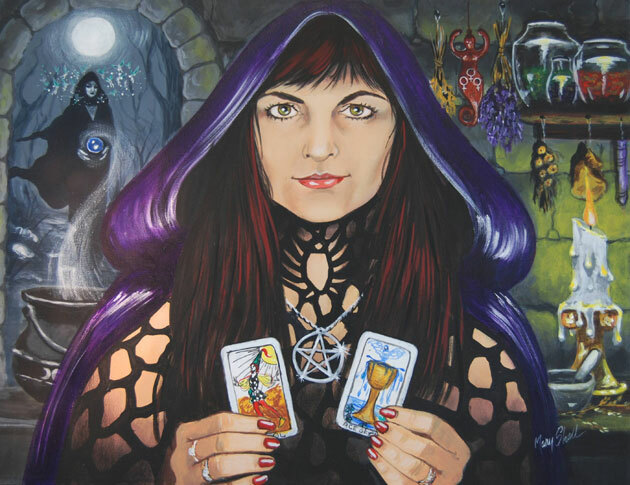 My training in the art of Tarot was from Rusty Canarious over 40 years ago. My many years of esoteric training was based on direct teachings from wise old pagan women as a child, then bolstered by my western Masters in psychology and religion My many years of training have given me outstanding knowledge and skills. Techniques of Wicca dovetail and overlap both native American philosophies and Buddhist practices. I am an adapt with these all. I am especially interested in the really weird stuff, the stranger the better, ghosts, demons, curses, but I am most glad to help with 'daily' magic as well - love, health, money, family career, law, all the endless challenges of living. As any professional minister, I officiate weddings and funerals, and counsel for all the transitions of family. "When nasty viruses infect the computers of folks up in Northern California, Reverend Joey Talley is on it. “No problem is too small, too big, or too weird” is Talley’s motto. Sure, she can do a love spell, but she’d rather face off with ghosts and demons.."
More... Reverend Joey in the News! works to an anthropology class at Chabot College. Or even better, CALL NOW! Patience! The video may take a few moments to load! "I want to thank you from the bottom of my heart for assisting me in shifting my consciousness while I was stuck in a negative space after my mom's death. I have never been through grief before, but I am also spiritually aware, so it was very frustrating to me that I could not move out of that space of fear. I met you at the Tea Temple one Thursday when you were offering free Tarot readings, and I knew that you were placed on my path for a specific reason. There are things you do that not a lot of people know. I am very open minded, and I don't ever question when people show up on my path. So I went to you and we had a wonderful session where I was taken out of my fear into a space of acceptance. I also feel much lighter (spiritually and emotionally speaking) since that day. Your gift is so beautiful, and I have a lot of respect for people who understand the elements of nature, how everything is connected, and how all of life serves a specific purpose in order to create a sacred balance. Also, you really know how to empower the divine feminine. This is something we need to tap into in order to restore balance on our Earth. I'm grateful to know you, and will refer you to my friends. You are a treasure. Thank you again. " "Compliments on your inspirational website. I am a 73-year-old retired Christian pastor and I have become attracted to the lovely spiritual paths followed by Wiccans and other Pagans. (Don't be too shocked!) Anyway I am a novice and I rely on websites like yours for information and enlightenment about your path. Peace and thank you." "I have twice used Rev Joey’s powers of persuasion to do some professional spell work for me and a friend. Both were business related issues involving threatening govt agencies with power to make life miserable. Both times the threatening events failed to materialize. Blessed be! Plus we were able to go on about our work without all the stress and worry and distraction of dealing with forces impossible to control and to remain productive in a time of great threat. I’m a believer in the power of positive thinking, but sometimes the worries are just too great. When that happens I call Rev Joey and, like her message says: 'Don’t worry, no problem too big or too small or too weird for the Wicca Way!'"